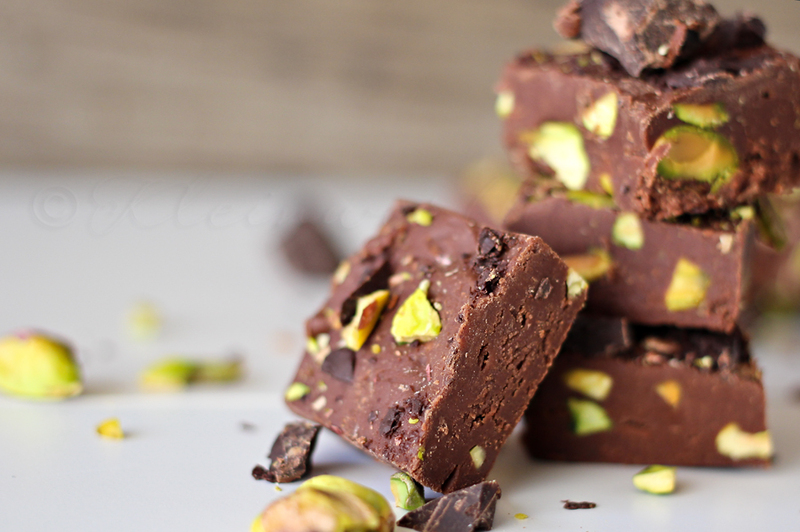 Dark Chocolate Pistachio Fudge is a delicious holiday fudge recipe that is the perfect blend of salty and sweet. Perfect for all those dark chocolate lovers! It is time for fudge! 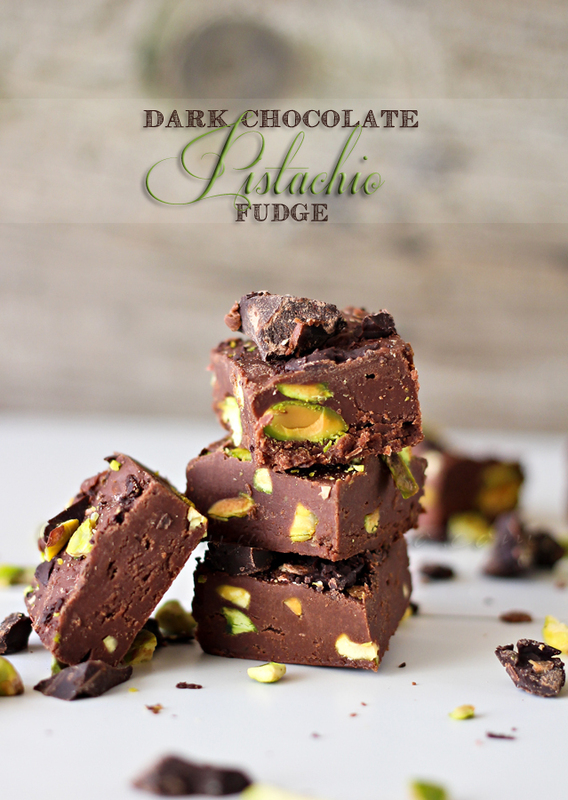 One of my favorites combines delicious dark chocolate and perfectly salty pistachios. It’s perfection in a bite sized dessert if you ask me! You know fudge is one of my favorite things this time of year. I love it so much & it brings back so many wonderful childhood memories. I shared my mom’s secret recipe with a twist over at Jen’s place – Tatertots & Jello earlier. But I wanted to be sure to share it here with you all today too. It’s amazing – you won’t be able to stop yourself. Just the right amount of salty to cut the sweetness – perfection. Oh, and if you can – add a little extra on top – for fun. 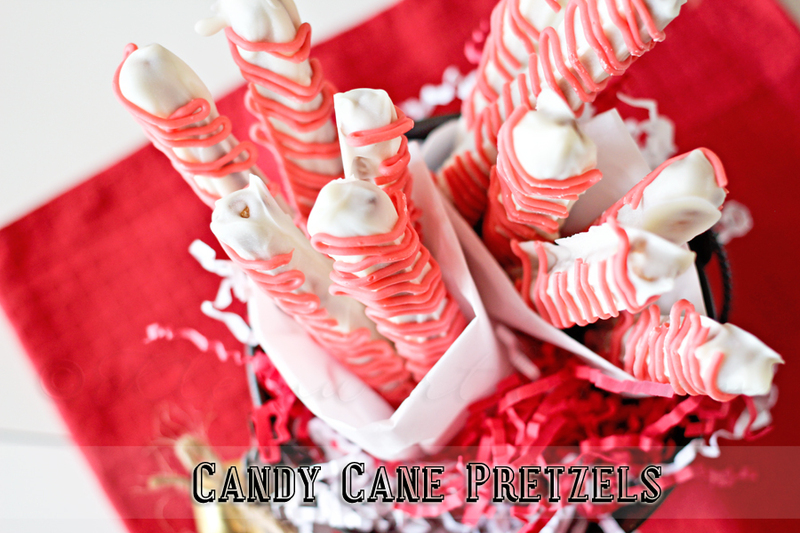 I make this for every holiday party & it’s always the first thing on the buffet to run out. People are not shy about going back for again & again. I like to just sit by the table & snack until it’s gone. 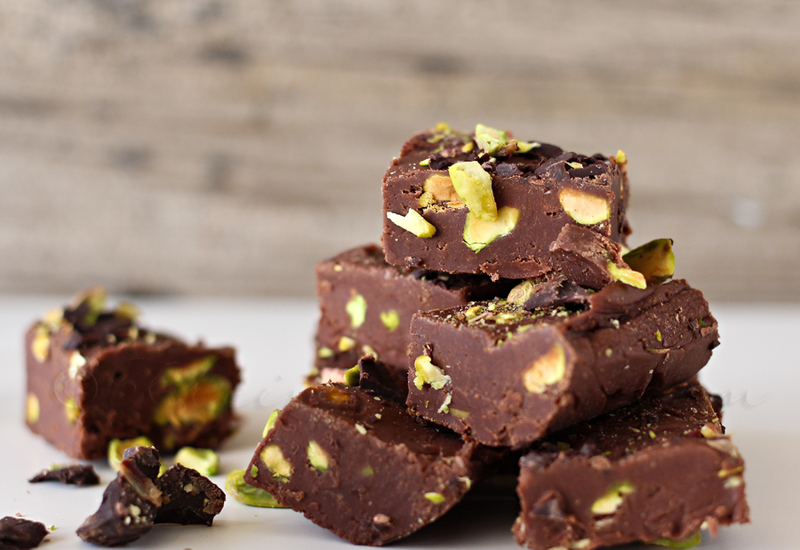 This is the creamiest, most amazing fudge you will ever eat. Melts in your mouth – incredible. 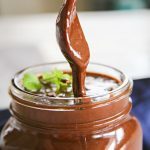 Yes, you can use all semi-sweet chocolate or milk chocolate for this recipe if you don’t want to make dark chocolate fudge. But please don’t try to make this with 100% dark chocolate. 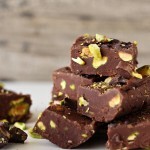 The chocolate won’t have the right fat ratio to keep the fudge creamy once cooked. 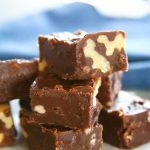 Why did my fudge turn out grainy or watery? This often happens when using low-quality chocolate. This is why I highly encourage you to use the best quality you can afford. I like to use either Guittard or Ghirardelli when making fudge. 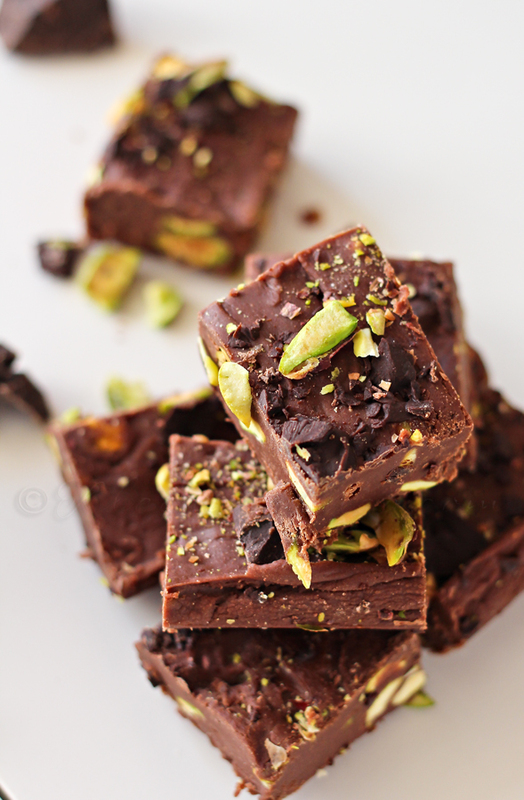 HOW DO YOU MAKE Dark Chocolate Pistachio Fudge? Line 9×13 glass pan with parchment & then spray lightly with cooking spray. Set aside. Put semi-sweet chocolate chips, dark chocolate chips & vanilla in mixer bowl. Set aside. Heat sugar, margarine, evaporated milk & marshmallow cream over medium heat. Stir until mixture boils, boil for 5 full minutes- stirring constantly. Remove from heat. Pour into mixer bowl over the top of the chocolate chips. Beat with whip attachment in mixer until it’s smooth & looks like silk. 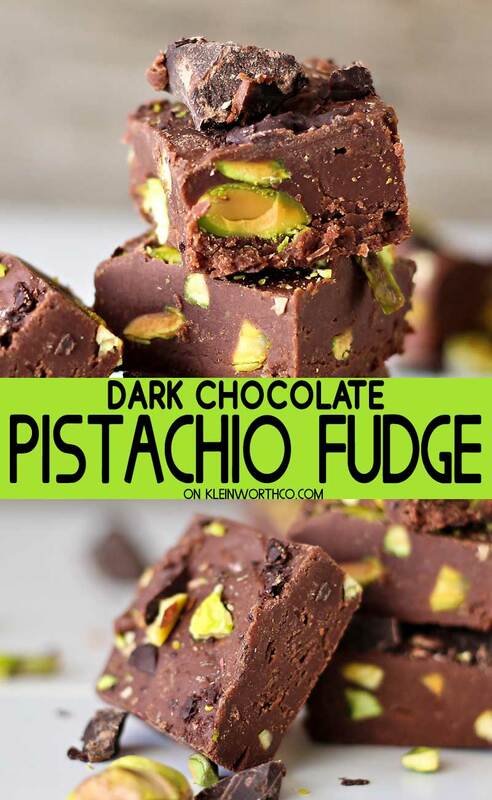 Add in pistachios – mix until just mixed throughout. Transfer to your prepared dish. 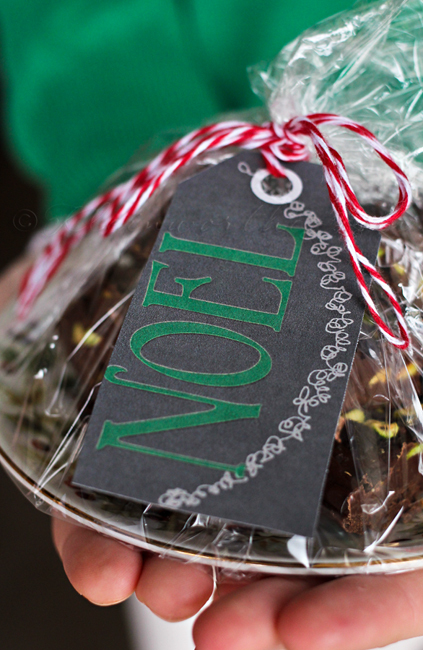 Top with remaining pistachios & chocolate chunks. Refrigerate for at least 2 hours before cutting & serving. 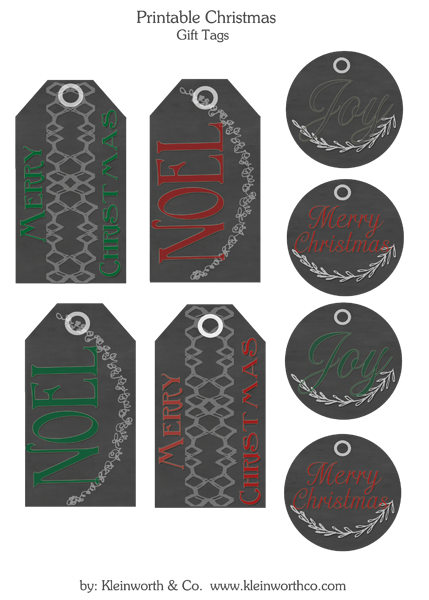 I also made the gift tags for you all to use in your holiday treat giving this season. Scroll down to grab the download. 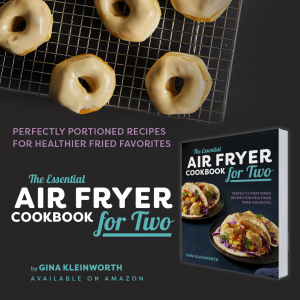 It makes a great gift for the neighbors too. 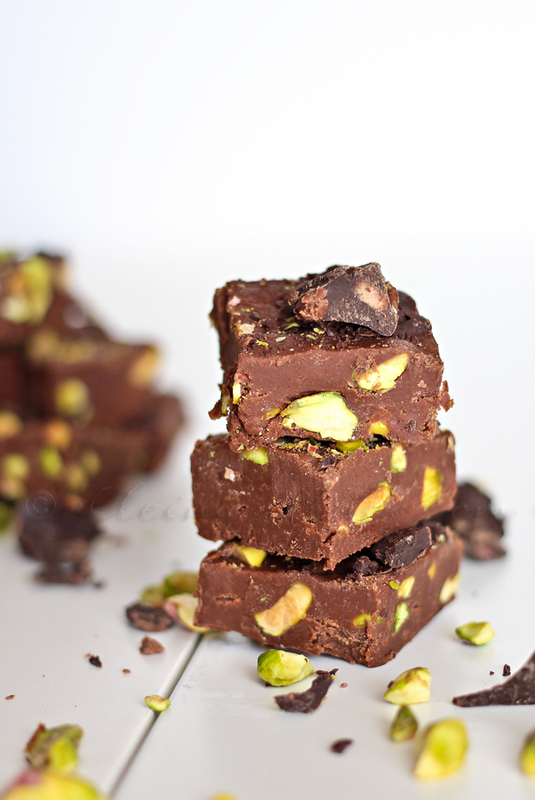 Love the pop of the green pistachios with the fudge. 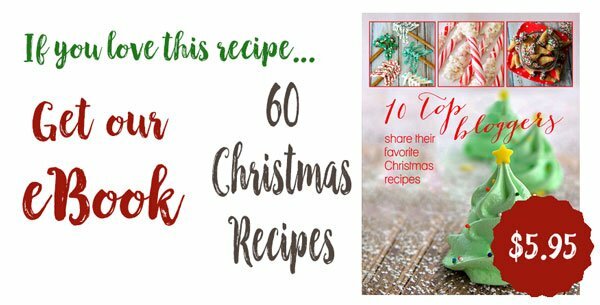 Looking for more treat ideas? Line 9x13 glass pan with parchment & then spray lightly with cooking spray. Set aside. Put 2 cups semi-sweet chocolate chips, 1 cup dark chocolate chips & vanilla in mixer bowl. Set aside. Heat sugar, margarine, evaporated milk & marshmallow cream in 3 qt. heavy saucepan over medium heat. Stir until mixture boils, boil for 5 full minutes- stirring constantly. Add in 1 cup chopped pistachios - mix until just mixed throughout. 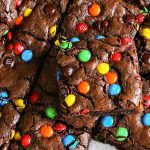 So lovely photos – looks very delicious! Wow they look soooooooooo good and you are the master of food photog! Beautiful! Gorgeous Gina! My Jack would love this fudge! What a wonderful reminder of your mom, too! Sounds delicious! The green goes so nicely in the fudgey brown and I bet the flavors are heavenly. Hope you’re doing ok my dear friend. Yumm. I’m going to have to try this soon. Thanks for sharing and linking up to Thrifty Thursday. I’ve been looking for a new fudge recipe. I think I’ve found it! Thanks! 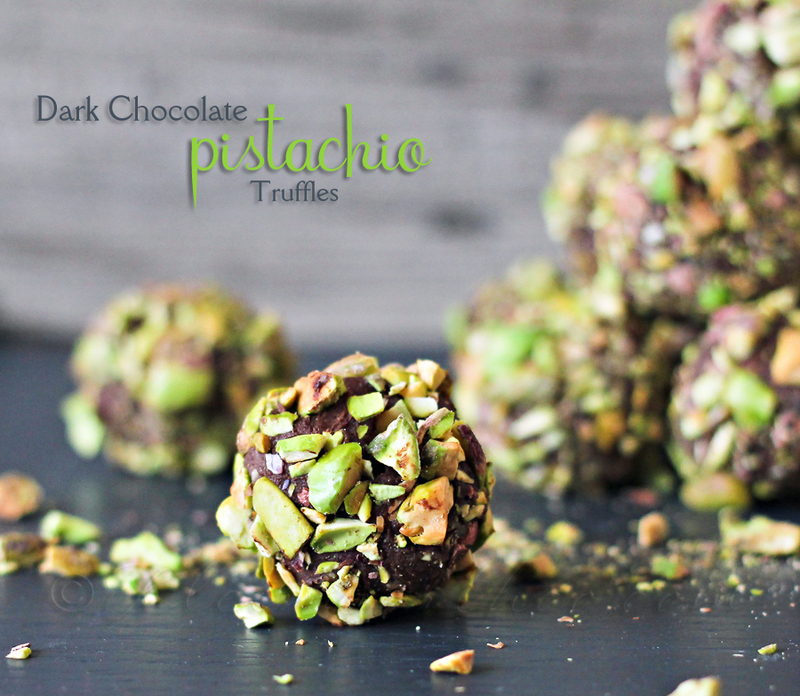 Love the dark chocolate paired with pistachio!!! 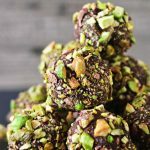 My hubby adores pistachios, but not dark chocolate. 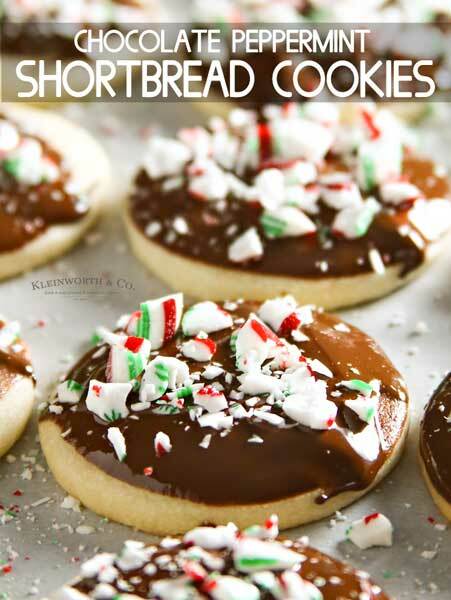 However, I can easily adapt this recipe using semi-sweet chocolate, and I plan on doing that. Thanks so much for sharing. Stopped by from Show Stopper Saturday! Can you tell me why no butter? 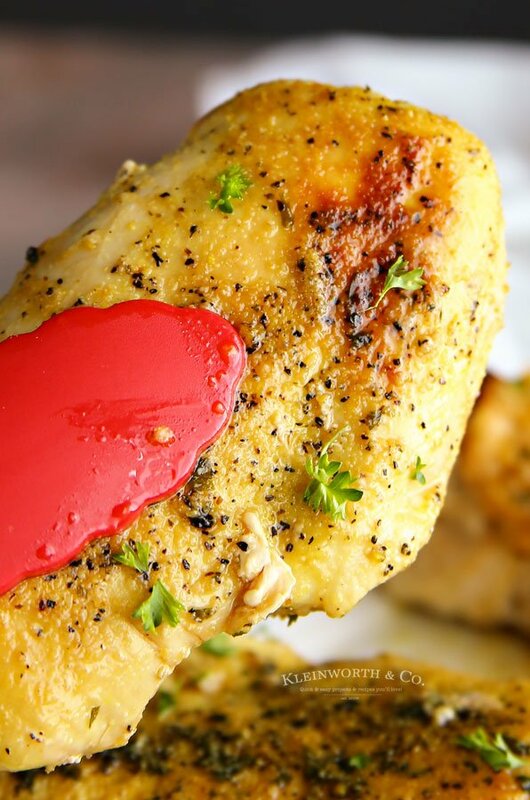 Hi Jessica- butter tends to give this recipe a dryer texture & it’s less creamy. I prefer my fudge to melt in my mouth & have found that this particular recipe does that better with margarine instead of butter.